← How to convert MS Office Excel to bmp using Document Converter? How to print MS Office Excel to bitmap image using Document Converter? docPrint Pro can help you to convert MS Office excel to bitmap image easily because docPrint Document Converter Professional is a software product that dynamically converts MS Office 97/2000/XP/2003/2007, WordPerfect, AutoCAD DWG, PostScript, Adobe Acrobat PDF and many other document types to Adobe Acrobat PDF, PostScript, EPS, XPS, PCL, JPEG, TIFF, PNG, PCX, EMF, WMF, GIF, TGA, PIC, PCD and BMP etc formats. It works in both GUI version and Command Line version. With docPrint Document Converter Professional you can convert your documents from and to 50+ formats easily.You don’t need to worry about the compatible problems with the system in your computer.docPrint Pro Support Windows XP, Windows 2000, Windows 2003, Vista and Windows 7. There are also some other advantages about docPrint Pro.docPrint Pro is a Windows printer driver that saves ink, paper and time by controlling printed output, it supports print 2, 4, 6, 8 or 16 pages on a single sheet of paper, it also supports scale A0, A1, A2, A3 papers to standard Letter or A4 paper sizes.docPrint Pro supports the image resolution to 72,75,96,100,120,150,200,300,600, 1200DPI.It can print your documents colored including grayscale or black-and-white ones and so on.If you want to learn more functions about docPrint Pro,you can visit the website http://www.verypdf.com/artprint/index.html to see the features of docPrint Pro. 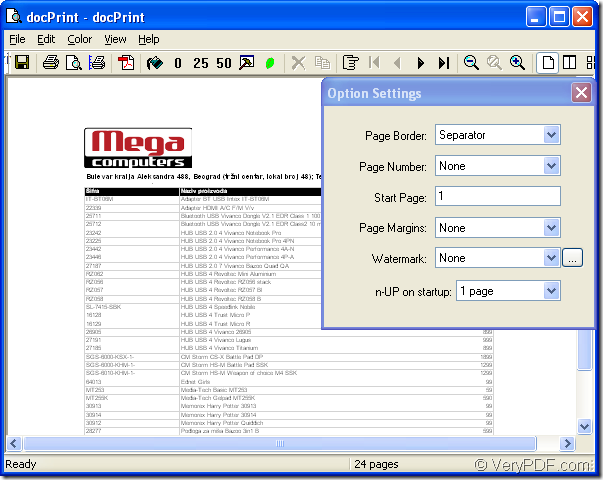 You need to download docPrint Pro at the following website:http://www.verypdf.com/artprint/docprint_pro_setup.exe. It is an executable setup file and you just need to double click the file and follow all the prompts appear in each installation wizard dialog box to install the software. Then you can experience docPrint Pro to convert excel to bitmap according to the steps below. You should open an excel file in your computer and click “File”—“Print” to pop up “Print” dialog box.Then you should set the current printer as “docPrint” in “Name” combo box and click “OK” button to continue your work.Or you can press “Ctrl”+ “P” combination which means “Print” to open “Print” dialog box. If you have set docPrint Pro as the default printer when you install it,it will ignore some useless operations for you,which will save you a lot of time.You can click the icon in the toolbar of excel file directly or right click the excel document and choose “Print” option in dropdown list to open “docPrint” dialog box instead of opening the excel file. 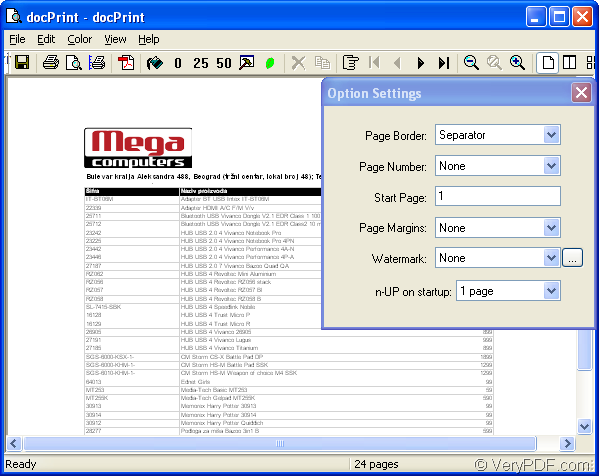 In popup “docPrint” dialog box,you can realize many functions such as selecting image resolution,saving file,combining multiple pages on one sheet,scaling paper,coloring and so on.But if you don’t want to set any parameters for the output file,you don’t need to care about the icons in the toolbar and the small dialog box called “Option Settings”,please see Figure1.You can cut to the chase—opening “Save As” dialog box.There are some methods you can choose here.For example,you can click “File” and click “Save as” in dropdown list.You can also click the icon in the toolbar,which means “Save”.The hot key “Ctrl”+ “S” will also give you a quick way to open “Save As” dialog box. 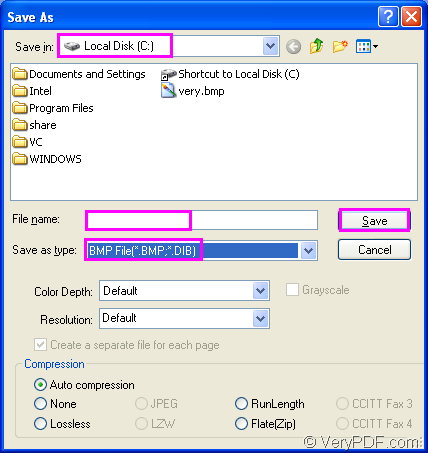 In “Save As” dialog box showed in Figure2,there are four steps to do:You can choose any location for the output file in your computer freely in “Save in” combo box.You can choose the existed location or a new created one.You can edit the name for the target file with any names you like in “File name” edit box.You should specify the format file for the output file in “Save as type” combo box in which there are many output formats and you can click “BMP File(*.BMP,*.DIB)”. (NOTE:BMP File is one kind of bitmap).At last,you should click “Save” button to run your conversion of excel to bitmap. It will cost you several seconds,not very long.The most important,the process of the conversion is very easy to learn.You can master it even though you have not heard docPrint Pro before or don’t have much knowledge about computer.Other articles will also help you to learn docPrint Pro more at the website http://www.verypdf.com/wordpress/. How to convert OpenOffice documents of ODT to PSD? This entry was posted in docPrint Pro and tagged excel to bitmap. Bookmark the permalink.